If you watch closely during when Javon Bess, Jordan Goodwin or DJ Foreman are shooting free throws, you’ll notice a small script tattoo on their shoulder. If you look really close, you’ll see that it reads “Team Blue”. Team Blue, of course, is SLU’s mantra, identity and guiding philosophy. Many teams have something like that, but it’s rarely such an integral part that players tattoo it on their bodies, carrying it with them forever. Suffice to say, Team Blue is special. 3 years after Travis Ford’s Billikens were picked last in the A-10, that brotherhood is going to play in the NCAA tournament. Playing in their 4th game in four days, Saint Louis mounted a massive comeback against St. Bonaventure to win 55-53, despite an incredible performance by Courtney Stockard. “I’m really proud of these guys for how they finished the game. They finished really strong, and that’s really impressive on these guys’ parts, being their fourth game in four days. That’s not easy to do,” Coach Ford said. The game did not start well for the Billikens. The Bonnies were in control early, and it looked like they were going to bury SLU in the first half. The Bonnies were up by as much as 15 in the first half. However, SLU was able to fight back and get the deficit down to 9 by the end of the half. Jordan Goodwin was the only Billiken who was effective in the first half really, scoring 10 points and adding 7 rebounds. The Bonnies outrebounded SLU 25-20 in the first half, and outhustled and outscrapped the Bills throughout. The Bills slowly but surely turned it around in the second half. They stayed with the Bonnies, never falling behind more than 10, but didn’t start to really make a run until 12:30 in the second half, when Isabell converted a layup, Dion Wiley came up with a steal which led to a Goodwin putback, and then Wiley hit a three. After not playing at all in the semifinal against Davidson, Wiley came up clutch for SLU. “Dion is the first guy in breakfast this morning. He walks in first before everybody else. Didn’t play a minute last night. Comes over, pats me on the back, shakes my hand, says ‘Coach, let’s get this one today,” Ford said. “So I thought, ‘he’s ready’”. The game then went back and forth, and SLU finally took it’s first lead of the game with 6:58 left in the second half when Isabell found Hasahn French for a layup to give SLU a 47-46 lead. After that, SLU didn’t give up the lead the rest of the game. Wiley added another three pointer to stretch the lead to 6, and then French hit another layup to get the lead to 8. Then it got dicey. SLU’s free throw shooting, its achilles heel all year, reared its ugly head as the team struggled to make free throws. Bona was able to close the gap, and had ball down two with 45 seconds left. Dominck Welch missed a three pointer, the Bonnies got the offensive rebound, then Kyle Lofton missed a layup. 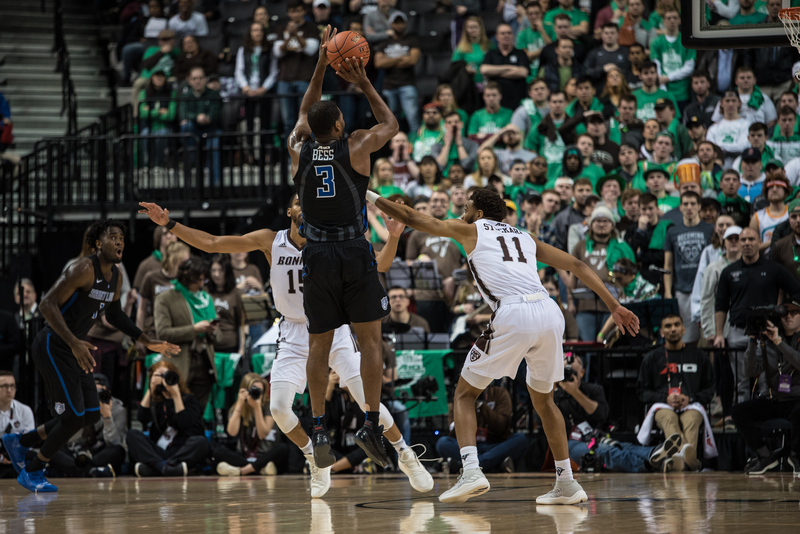 The ball went out of bounds off SLU, and Bonaventure had one last chance, but Nelson Kaputo missed a three pointer, and SLU pulled out the win despite shooting 46 percent from the line. St. Louis native Courtney Stockard was never offered a scholarship by SLU, and the first team A-10 player almost got the ultimate revenge on SLU. It would have been fitting for SLU’s chance at an NCAA Tournament bid to have been foiled by an act of coaching negligence on Jim Crews’ part and Stockard did his best to make it happen. He scored 22 points on 7-12 shooting. Stockard went 6-9 for three and there were stretches in the game where he couldn’t miss. However, he fouled out trying to steal the ball from Bess with 55 seconds left and had to watch the game from the sideline. For SLU, Bess and Isabell both struggled, but Jordan Goodwin picked up the slack, scoring 16 points and pulling down 14 rebounds, 6 of which came on the offensive end. The sophomore guard provided a spark for the Billikens, and when Bess and Isabell finally got hot with 10 minutes left in the half the Billikens pulled away. Another key was Travis Ford’s decision to stick with the man-to-man defense instead of SLU’s usual strategy of switching defenses. “Tonight we started out changing defenses and none of them were working except the man-to-man, so we just stuck with that” Ford said. Javon Bess and Tramaine Isabell were both named to the all-Tournament team, and Isabell was named Most Outstanding Player of the Tournament. For his efforts, Isabell will get to play in his first NCAA Tournament, after a career that spanned time at Mizzou, Drexel, and now Saint Louis. “Coach Ford said I’d be a part of something special, and I believed him” said Isabell. It’s been an up and down season for SLU, but Team Blue’s brotherhood stayed true all along. The team stayed tight and everything clicked when it needed to, and now SLU is playing in the NCAA Tournament. They aren’t done writing their story yet. “I don’t think we’re done yet. I think we still have a lot to prove,” said Isabell.